Celebrate your Kid's BirthDay with this original, hip b'day song that's got a great groove and fun lyrics. 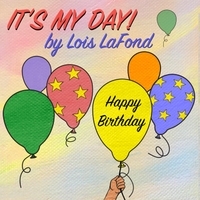 "It’s My Day" is a re-release from Lois LaFond’s 1986 WHILE CREATURES OF SUMMER SLEEP (as cool now as when it was born). Sing, dance, and party on! For over three decades, Lois LaFond's songs and stories have delighted Children and their Families. Hailed as music that "even the parents love," Lois has combined her passions of music and children by writing, producing, and recording six albums emphasizing Diversity and Self-Esteem. Her sophisticated world music has captured awards, kudos and national acclaim around the country from the L.A. Parent to Downbeat magazines. Her band, LOIS LaFOND & THE ROCKADILES has toured from Central Park to San Francisco and from Alaska to the New Orleans Jazz Fest. The latest song to be available on CD Baby "It's My Day," celebrates the most important event: your child's birthday. With a danceable groove and lyrics that are fun for kids, the chorus is quick and easy to learn. Add another song to the traditional "Happy Birthday," and get up and dance!